During archival storage, the AIP is moved into its storage repository. Should you run into an error during archival storage, please see Error handling. If you are running Archivematica in indexless mode (without Elasticsearch), the Archival Storage tab will not appear on your dashboard. Once ingest is complete, selecting a location to “Store AIP” in the Actions drop-down menu compresses and zips the AIP and moves it into Archival storage. 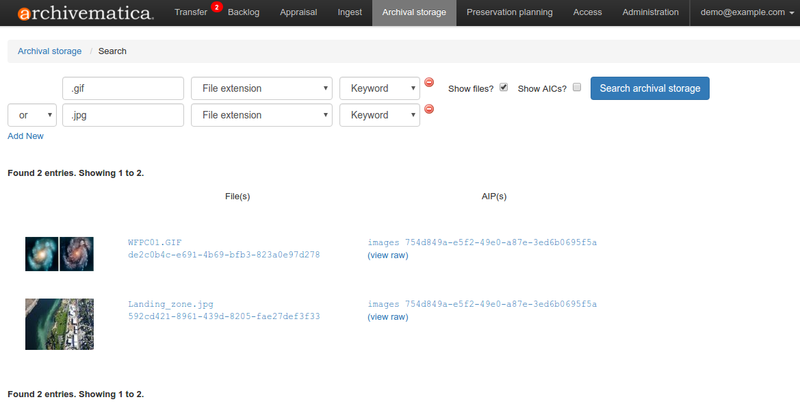 In the demo version of Archivematica the AIP storage directory is /sharedDirectoryStructure/www/AIPsStore/. In other environments it can be a remote network mounted directory. If multiple AIP storage locations have been created in the Storage Service, each will appear in the Store AIP location dropdown, including LOCKSS locations. The AIP directories are broken down into UUID quad directories for efficient storage and retrieval. Archivematica uses a directory tree structure to store AIPs. The tree is based on AIP UUIDs, which are 16-digit alphanumeric unique universal identifiers. Each UUID is broken down into a manageable 4-character chunk, or “UUID quad”. Each quad represents a directory. The first four characters (the first UUID quad) of the AIP UUID will compose a subdirectory of the AIP storage. The second UUID quad will be the name of a sub directory of the first, and so on. The last four characters (the last UUID quad) are used to create the leaf of the AIP store directory tree, and the AIP with that UUID resides in that leaf. The Archival storage tab in the Archivematica dashboard consists of a table with information about the stored AIPs. Use the up and down arrows in the column headers to sort by AIP name, size, UUID, date stored or status. Note that at the top of the table is the total size of the stored AIPs and the number of indexed files. To open a copy of the AIP, click on the AIP name. You can then open or download the zipped AIP. The AIP pointer file can be accessed by clicking on the Pointer file link. The pointer file provides information on the AIP and its relationships to the Archivematica, DIPs, and other AIPs as appropriate. Beginning in the 1.7 version of Archivematica, institutions are able to encrypt their AIPs for secure storage. This feature is particularly useful when an institution stores its AIPs off-site. 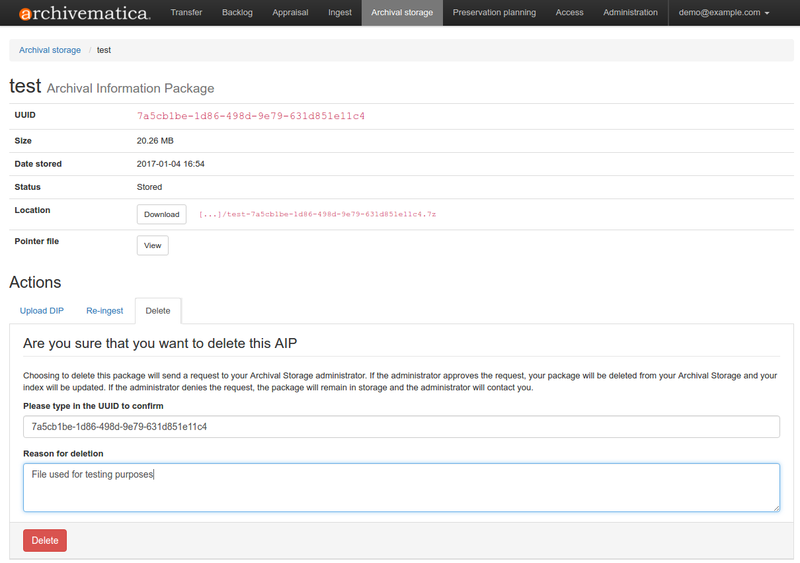 To create an encrypted AIP, Archivematica needs an encrypted space and location set up in the Storage Service. Please see Encryption for more information. Run your transfer through the regular micro-services. At the Store AIP location job on the Ingest tab, choose your encrypted AIP location. You now have an encrypted AIP! You can tell if your AIP is encrypted on the Archival Storage tab. Encrypted AIPs appear as True in the Encrypted column. The AIP pointer file contains a PREMIS:EVENT element for the encryption event. The AIP itself can be downloaded in unencrypted form from the Archival Storage tab. To search the AIP index, use the search bar at the top of the screen on the Archival Storage tab. Use the first dropdown menu to select whether to search for the File UUID, File path, File extension, AIP UUID, or AIP name. Use the second dropdown menu to select whether to search by keyword, phrase, or date range. Select Show files? to display discrete files in your results. Select Show AICs? to display Archival Information Collections (aggregates of of multiple AIPs) in your results. The search index includes AIP names and METS contents. All METS metadata is indexed and searchable. Clicking on the name of an AIP will open the AIP information page. From this page, it is possible to upload an associated DIP, re-ingest the AIP, or delete the AIP as well as downloading the AIP or viewing the pointer file. Clicking on the name of an image will open the image in the browser. By clicking on “View raw” next to a search result, you can also view the raw JSON data that contains the METS data, the Archivematica version that generated the data, the AIP UUID, the time indexing occurred, and the relative file path within the AIP. To request AIP deletion, click on the name of the AIP to open the AIP information page. In the Actions section at the bottom of the page, select Delete. To delete the AIP, you must enter the UUID. Archivematica will also ask for a reason for deletion. Click delete. When you refresh the Archival Storage tab, the status of your AIP should now read Deletion requested. Choosing to delete an AIP will send a request to your Archival Storage Service administrator. If the administrator approves the request, your AIP will be deleted from your Archival Storage and your index will be updated. If the administrator denies the request, the AIP will remain in storage and your administrator should contact you. Note that Archivematica tracks the location and existence of AIPs in 2 ways: within the Storage Service and in the Elastic Search index which you can search via the dashboard. Deleting AIPs directly from the file system rather than through the Storage Service will cause inconsistencies in both applications and is not recommended in a production environment.